Civil resistance campaigns should avoid the belief that the people and the military are always “one hand,” as has been chanted so often in Egypt. Millions of people demonstrated throughout Egypt over the past month, once again demanding the fall of the regime. 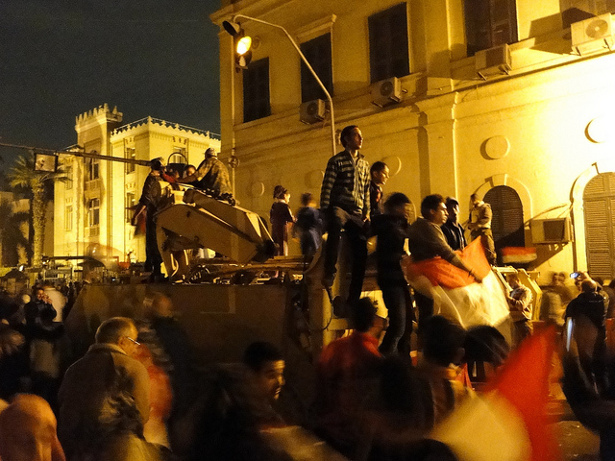 Former president Mohammed Morsi’s regime fought back, but the people stayed. Finally, the army stepped in and forced the ruler to step down. “The people and the army are one hand!” chanted the crowds. Masses of ordinary Egyptians, it would seem, compelled one part of the regime to turn against the other and bring about change. Scholars of civil resistance often argue that one key mechanism for change is defections — in which key loyalists and functionaries withdraw their support from the power structure. Examples include transportation workers during the California farm workers’ movement, security forces during the People Power campaign in the Philippines, or the so-called “refuseniks,” the Israeli soldiers who declined to serve in the occupied Palestinian territories during the First Intifada. In reviewing the historical record of more than 100 civil resistance campaigns between 1900 and 2006, Maria Stephan and I found that security-force defections dramatically increase the chances for nonviolent resistance to succeed. Such changes of course among elites can go a long way toward bringing about the will of the people. During Egypt’s recent turmoil, meanwhile, one could argue that there was too much collusion between nonviolent people power and security forces. After several days of demonstrations and protests by the well-organized, millions-strong Tamarod campaign, the Egyptian military declared that it had no choice but to remove Mohammed Morsi from power. Yet there are indications that Tamarod organizers and military elites had coordinated their plan for months. As early as February of 2013, some senior Egyptian army officers were in private talks with liberal opposition groups, asking them whether they would approve of the military ousting Morsi. Such accounts indicate that this was less of a process of protest-induced defections than of a popularly backed coup, with uncertain implications for human rights, democratic transition, economic well-being and civil stability. Shirking is a form of defection in which regime functionaries disobey discreetly and with plausible deniability. In general, this form of defection looks like foot-dragging, calling in sick or intentionally doing a bad job. It is easy for such defectors to deny that their shirking is intentional or political, meaning that such activities carry lower risk for such participants than full or partial defection or outright disobedience. As Serbian organizer and trainer Ivan Marovic is fond of saying, “Insubordination is easy to punish, but incompetence is not.” When there is evidence of shirking, it may also suggest that the loyalties of the security forces may be vulnerable to costlier forms of defection, too. A similar process occurred during the People Power revolution in the Philippines in 1986. After several senior military commanders defected, Ferdinand Marcos sent tanks and armored personnel carriers to their encampment to confront them. As loyalist troops approached the camp, civilians formed human barricades in front of the tanks. Demonstrators offered candy, food, cigarettes and flowers to the troops, asking them not to proceed. After a time, the tanks began to advance. Loyalist commanders ordered that the troops clear the crowd with live fire and attack the camp with mortar and cannon rounds regardless of the civilians in the way. In Serbia, during the successful struggle to oust Slobodan Milošević, outright disobedience occurred at lower ranks, with police simply refusing to act when orders came over the radio to shoot at protesters marching on Belgrade. According to one policeman, his decision to ignore the order came easily, as he knew that his kids were in the crowd. Regardless of whether outright disobedience occurs at the top or lower levels of command, however, the political consequences can be identical: The power-holders often depart from office once they realize that the cooperation and acquiescence of security forces has been lost. For those seeking greater civilian control over the outcome of civil resistance, outright disobedience is almost always the most promising form of defection, since it means that security forces are fully prepared to submit to popular will. Whatever form a defection takes, however, the greatest challenge is to ensure that the movement is the motive force driving the defections. The movement should be compelling those in power to do something they might not have wanted to do otherwise, rather than just allowing them to do what they meant to do all along. The Egyptian army apparently wanted to get rid of Morsi, and it seems to have used the movement to do it. On the other hand, the Serbian policeman had no intention of disobeying orders, but the movement forced him to do so, just as overwhelming civilian pressure made Filipino troops re-evaluate their position. Establishing and maintaining movement control over defectors greatly reduces the chances that they will turn around and initiate a civil war or consolidate power into a military junta. Of course, civil resistance campaigns cannot always control the form that defections will take. In many instances, those belonging to certain pillars of power will never be available or willing to defect in any overt form. Take the anti-apartheid movement in South Africa, where security forces continued mass repression against black townships up until the end, even as boycotts of white business, international sanctions and divestment campaigns forced the South African government to the negotiating table. Such cases suggest that civil resistance campaigns should focus on producing shifts within several different pillars of support, such as among economic and business elites, state media, state education systems, religious authorities and civilian bureaucrats. These elite groupings can be much less risky as targets of persuasion, and the outcomes of their loyalty shifts are easier to manage and less devastating to society in the long run. In the meantime, civil resistance campaigns should avoid the belief that the people and the military are always “one hand,” as has been chanted so often in Egypt. Instead, they should see that security forces have their own interests, and they can easily manipulate the movement to suit their own purposes in ways that undermine the movement’s own agenda. Movements with massive and diverse participation, nonviolent discipline, and the ability to withstand repression have been historically capable of forcing those in power to change. But only when a campaign pressures elites to suspend or reevaluate their own interests will they step out of the way of genuine transformation. What you’re describing is similar to what Antonio Gramsci theorized: a war of movement (what happened in Egypt as you describe it) vs. a war of position (what you see as needing to happen). Without a solid grounding in theory, the Left will be led astray, as you have so cogently pointed out in the case of the struggle in Egypt. Here is an article that may help those who are not familiar with Gramsci. Lesson: Don’t trust the military elite to run a revolution. The people must lead, not the military leaders. I wouldn’t write off what just happened in Egypt so quickly, there is a very real (r)evolutionary movement there. And what Duke’s Coach K said about basketball can be said about the (r)evolution in Egypt and elsewhere, “the game is a game of adjustments.” To that we could add that those who persist, have the best chance at winning.